MURCHISON, TX (MAY 1, 2017) – For many seeking enhanced protection for themselves, their loved ones and their belongings in the event of a major natural disaster, widespread civil unrest, or infrastructure breakdown, Rising S Company offers a rather unusual, but formidable solution. The company, founded in 2003, builds 100 percent steel, underground bunkers. “Our bunkers can be used as storm shelters or, more commonly, as refuges in the case of widespread civil unrest or nuclear attack,” according to General Manager Gary Lynch. “We provide bunkers for customers all over the world, from all walks of life,” says Lynch. Among the company’s clients are prominent politicians, including senators and governors, he says. Although most of the bunkers are installed in rural areas, that is not always the case. “We just finished installing a bunker in the heart of downtown Chicago,” reveals Lynch. The bunkers range in price from $39,500 to $8 million and can contain anything from basic living quarters to amenities like bowling alleys, gun ranges, swimming pools and personal gyms. 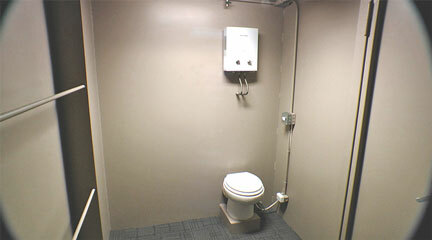 However, no matter what, one component that anyone surviving in an underground bunker will need is indoor plumbing. “If the infrastructure that society relies on becomes dysfunctional, self-sufficiency becomes the reality of life,” states Lynch. To make its bunkers self-sufficient from a plumbing standpoint, Rising S has been using drain pumps and macerating toilets for the past few years. Originally, the Texas-based company installed compost toilets exclusively, before deciding to explore an option that would eliminate waste instead of simply composting it. Composting toilets, in addition to creating the potential for odor, require regular maintenance, and Rising S wanted to mirror the simplicity of using a home toilet in its underground living spaces. 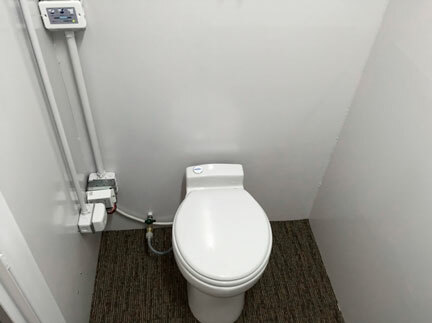 One of Rising S Company’s first pumps was the Sanibest Pro, which employs a heavy-duty grinding system that easily handles the accidental flushing of sanitary articles, such as feminine products, baby wipes, dental floss, condoms, etc. The pump’s 3,600 RPM motor, typically powered by DC voltage or solar power, grinds waste into slurry, which is then ejected through a ¾-inch discharge line and pumped up to 25 feet vertically or nearly 150 feet horizontally to a septic tank or city sewer. 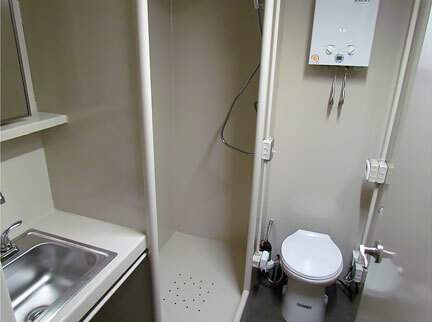 More recently, Lynch has begun installing the Sanimarin35, which combines a macerating pump and an electronically activated toilet into a single, compact package. Models that are 12 and 24 volts incorporate a dual-flush mechanism that sends only a small quantity of water to the holding tank: 0.31 gallons of water for the economical (“Eco”) cycle and 0.58 gallons for the normal cycle. The latter is adjustable to 0.79 gallons. “We like these models because they combine all the necessary components into one compact toilet package and allow for an eco-friendly flushing option,” explains Lynch. “The water supply comes from an underground tank or well, so conservation is crucial in such a scenario.” In addition to wastewater pumps, Rising S also installs gray water drain pumps that discharge water from sink, shower and laundry applications in the bunkers. SFA SANIFLO U.S.A. – whose parent company originated macerating plumbing technology – offers a complete line of up flush toilets and gray water pumping systems for residential and commercial applications. Saniflo developed its innovative, “above-floor plumbing” technology more than a half-century ago and has led its commercialization worldwide. Today, the company markets macerating technology through 24 subsidiaries in 50 countries and has sold more than seven million units worldwide since 1958. Saniflo markets through independent sales agents throughout North America, and the product line is currently available at distributor and dealer locations throughout the United States and Canada. Saniflo macerating toilets grind waste to slurry before pumping it to a septic tank or city sewer, when used as part of an underground bunker. 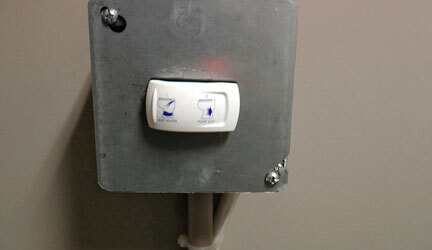 Certain Saniflo models incorporate a dual-flush mechanism that sends only a small quantity of water to the holding tank.